MTN BIKE JUNIOR LEAGUE | Maverick Sports Promotions - Where the athlete is first! 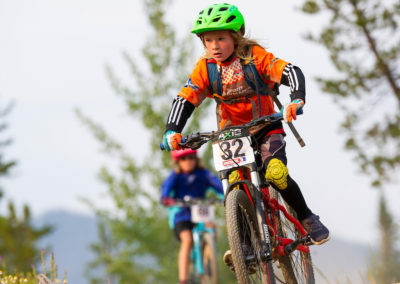 Welcome to the 18th season of Mountain Bike Junior League (for a good story ask me about the program’s original name and the lawsuit we were threatened with…LOL). Hundreds of kids have come before you and have helped to shape a very unique and rewarding program! There are no mandatory components to the program. Prefer to come to the Group Rides and not race? No problem! Prefer to race and not come to the Group Rides? Still not a problem! Prefer to pay the fee just to get a cool jersey and support the program? Still no problem but at least give it a try will ya? Mountain Bike Junior League is casual! It’s fun! It’s almost free! The teacher in Mountain Bike Junior League is the environment, the terrain, and the voice inside each of us that tells us the truth! If you’ve ever wanted to be a mountain biker and just didn’t know how to get into it then you’ve come to the right place. Let us share our passion with you and your family! 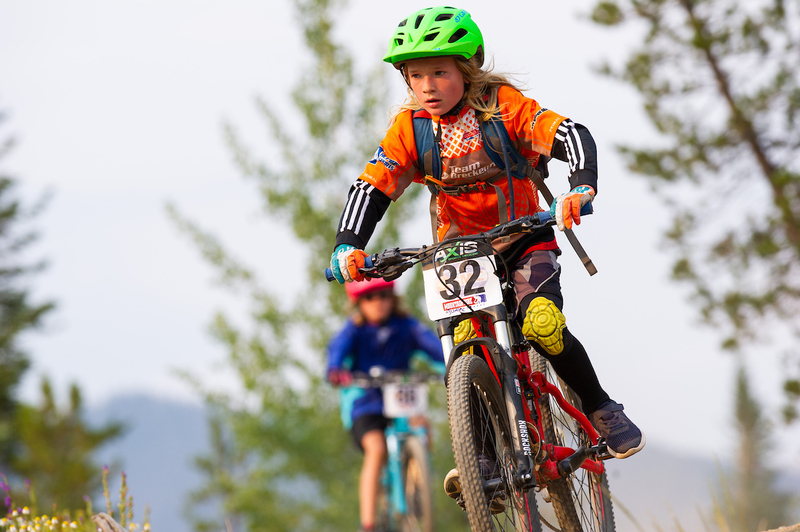 WHAT IS MTN BIKE JUNIOR LEAGUE? 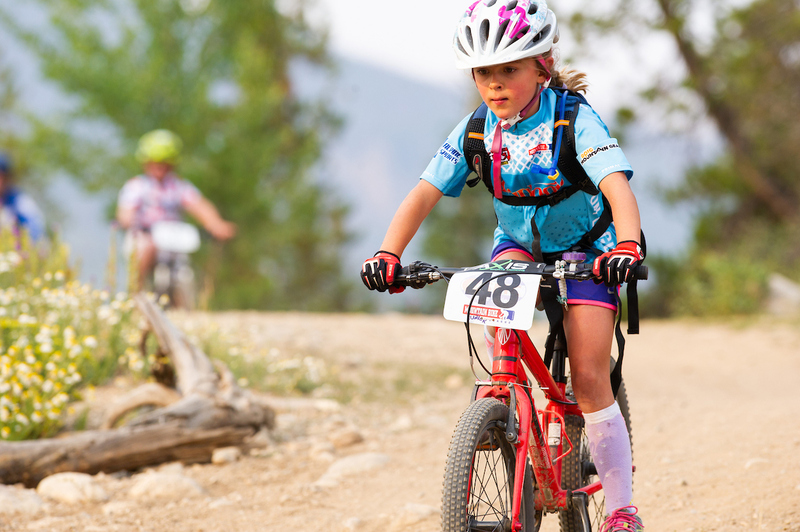 What is Mountain Bike Junior League? Good question. A question that requires a little background info. It started in 2001 with the birth of Maverick Sports Promotions. The roots of the league are pretty humble. We put our heads together and came up with ways to remove the obstacles that might be preventing kids from riding and racing their bikes. While we couldn’t do much about the cost of buying a bike, we could do something about the cost of participating in the local Wednesday night series, The Summit Mountain Challenge. The answer was simple: make it free to all juniors. So we did! I’d like to say that the rest was history, but that would be untrue. At our first race of 2001 we had 11 juniors. It was a little underwhelming. Then at the second race we had 16. Better, but still not great. At the next race we had 25 junior racers. Not an out-and-out impressive number, but a validation of the fact that participation was on the rise. By the end of the summer of 2001 we had three races in the books with over 50 junior competitors. It was a huge victory! The idea when it came was simple; why reinvent the wheel? There are kids programs that have been around for over half a century, Little League and Pop Warner Football being two good examples. What we ended up doing was “borrowing” elements from other youth programs and blending them or altering them to make them more relevant in our community. The result is called Mountain Bike Junior League (ask me about the original name of the program and the lawsuit that almost came down on my head…LOL). We’d keep it free, or at least very cheap, and we’d sell team sponsorships to local merchants to offset the administrative costs. All the kids would get a custom jersey, free entry into the Summit Mt. Challenge races, and the opportunity to attend group rides throughout the summer. Awesome! We couldn’t wait. Here’s where it got real interesting! Summit County is an area unique in the United States in that we are winning the battle of trail access and use (this is due in LARGE part to the dedicated work of Friends of the Dillon Ranger District, The Summit Fat Tire Society and local Open Space and Trails Planners.) We serve as a great example to other communities that are faced with user-conflict and trail damage issues. We’re winning the war, but that doesn’t mean we aren’t losing a battle or two here and there. We’ve all seen someone who doesn’t know the drill come ripping around a corner sliding or skidding their rear tire. We’ve seen the occasional rider going around wet spots in the trail thus widening it (called braiding), or even blatantly riding when conditions are just too wet. It’s probably safe to assume that some of these folks are idiots, but all of them? We prefer not to think so. You have to believe that some of the bad behavior out there was the result of ignorance. Bandit trails were popping up all over the backcountry. A well-placed piece of education could go a long way in reducing the number of trail abusers out there. Here at last, with a kid’s program that we felt was going to be huge in terms of participation, was an opportunity. A huge one. What started out as a youth development program turned into an environmental stewardship program before the first kid even signed up. The racing and the jersey are the ‘bait’. They’re what get kids interested. The ‘switch’ is the education that they walk away with. 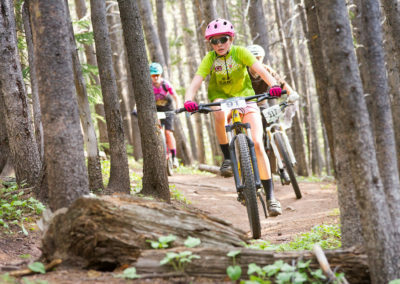 The kids learn about the environment, how to interact with other trail users, trail etiquette, some basic rules of the backcountry, and basic riding techniques. They learn about racing and healthy competition. They learn to overcome adversity and to be independent. They learn to have fun and respect each other. They learn to take joy in each other’s victories and console each other in defeat. We firmly believe that sport can be a healthy, safe, fun, and upbeat atmosphere. It produces better, more well-rounded human beings. The league is entering its 18th season. Some kids that started with us have pursued competitive cycling at the National and International level. Many MTB Junior Leaguers have stood on the podium of big events. That is somewhat gratifying. More rewarding is the fact that a new generation of backcountry users has been born. A new culture has taken shape. So thanks for signing your kid up. From everyone who ever rode a bike or used a trail. Anyone wishing to “Race Up” must be pre-approved to do so. Please send me an email and we can discuss! Automatic entry into the first 6 races in the Summit Mountain Challenge Series, no need to register for each race…register for the League and you’re done! Awards given to Top 3 at each race and to the Top 3 Overall counting the best 5 of 6 races. All Group Rides, scheduled on Mondays, see Group Ride Schedule. Register online (extra $5 Service Fee) by clicking the Register button! This is a partial list…each member is responsible for being prepared! Please come to Group Rides and races with equipment in good working order. We support ALL the shops in Summit County. Continue to support your favorite shop and let them help you be prepared! Group Rides are open to anyone with one restriction. Those on 20″ wheels must have their own chaperone. Big Ride Thursdays are from 8:30 to approximately 1:30pm. You must be at least 11 years of age and you must be pre-approved for Big Ride Thursdays. Group Rides are from 5-7pm and locations/directions will be published HERE in the days leading up. There is no minimum age to being a League Member…rather, there is an equipment requirement! 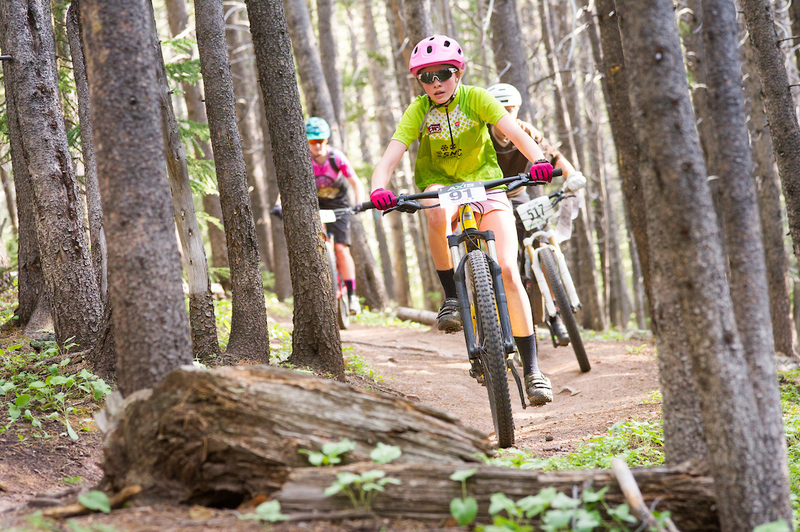 All Mountain Bike Junior League members must be on a bike with at least 24″ wheels. Take my word for it…it makes a huge difference. Notice I said “members”. Families may still bring kids to group rides that are not big enough to fit on a bike with 24″ wheels. Here’s the catch. You need to be responsible for them. That is, if they need extra attention, can’t keep up etc., you need to be their guide. And we don’t recommend they officially join the league until they are able to meet the requirement. What we’ve learned is that the equipment makes a huge difference in a rider’s performance. We know there are phenoms out there that can pedal their tails off on a 20″ wheel bike and hang. But the true dividing line is 24″ wheels. Why? Because of the Fun Factor. 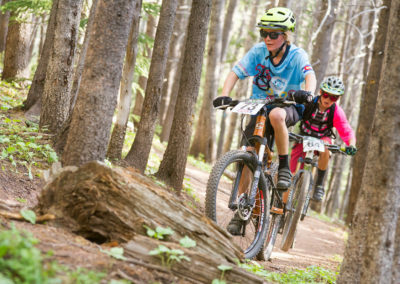 We take kids on true mountain bike terrain. It’s amazing what they are able to tackle if they are on the proper equipment. It’s just more fun! So…to recap…there is no minimum age requirement. If a kid can fit on a bike with 24″ wheels then they are eligible! 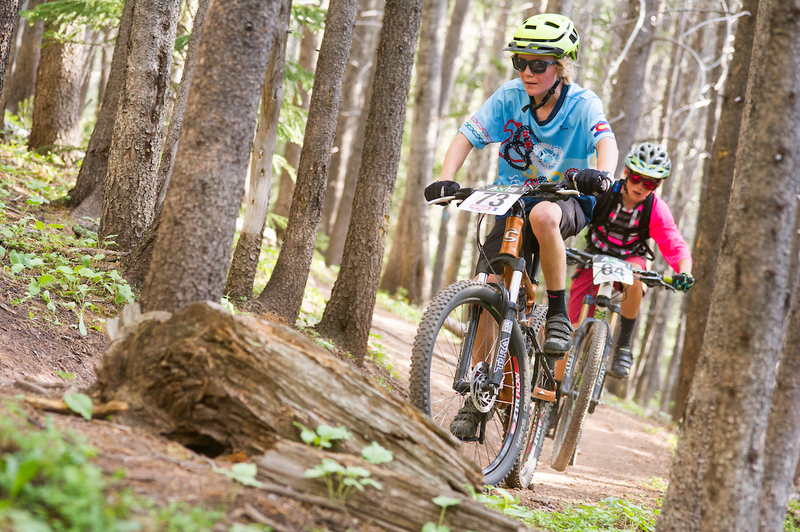 Mountain Bike Junior League is made possible by the generous support of the many sponsors. Please recognize these businesses by frequenting them when possible and thanking them at every opportunity! Following is the race schedule for 2018. Details for each race will be posted in the Summit Mountain Challenge section of this website. Race details are usually available within about a week of each event. 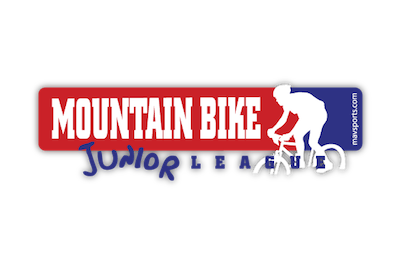 All MTB Junior League members are automatically entered! September 9th The Fall Classic, not included in League Fee, additional Entry Fee required and The Fall Classic includes a T Shirt and post race meal! Well…try as we do to de-emphasize the competitive aspect of the program the racing is a part of it. The top three racers in each category will be recognized at each race and at the end of the season. A racers best 5 of 6 races will be used to comprise their total score at the end of the season. 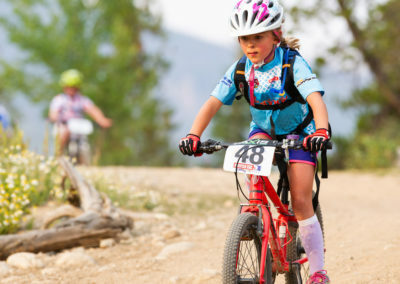 The MTB Junior League registration fee is $100. Each family has the opportunity to receive a $50 refund, per registrant, by working 4 hours ($12.50 per hour) throughout the summer. Other Maverick events are open to the Work Deposit program with the exception of the Firecracker 50.